How exciting, a competition from Clickstay.com to win a holiday in Italy. 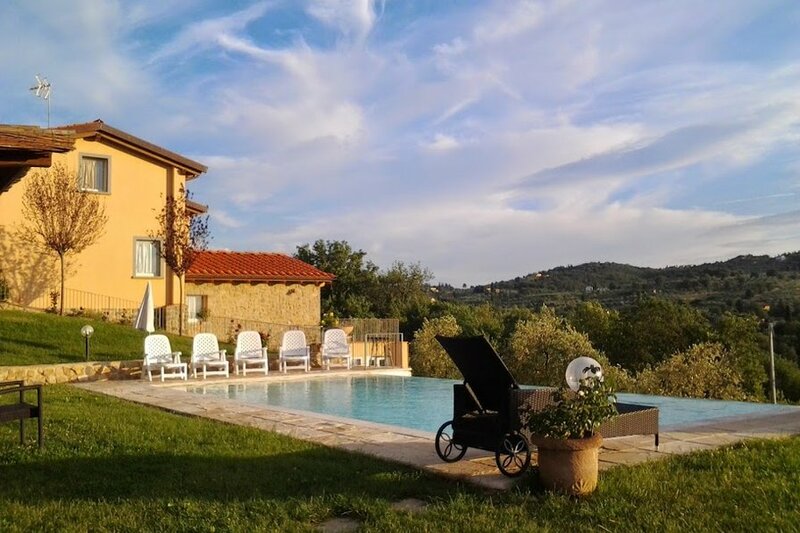 Whilst I have never been to Italy it is on my bucket list and I chose a lovely 12 person villa in Tuscany. I am meant to tell you who my dream guests would be and I am sure they are meant to be super exciting but if I invited Raymond Blanc he would have smashed all the glasses within minutes as he is like a helicopter with his gesturing. James Martin would be exciting but for other reasons plus he could bring his motorbike, or one of them, and give me a go, I still have my bike licence from my Harley Davidson days. I could invite Jason Atherton or John Campbell but they still scare me a bit. John Torode would be great, as would Daniel Galmiche as they make me laugh. Note all those chefs are passionate. Is this why they are such good cooks. Oh gosh I could invite Michel Roux Jr but then I would have to admit having the weirdest naughty dream about his dad! Tom Kerridge would be great and I like his accent, I bet he calls girls gurrrls in a West Country way. Why choose this villa? Firstly we wont get an asbo for our noise, it has a pool which we will all love and it is in the perfect place of Tuscany. Plus it has internet. Lets leave the chefs out, I am actually going to invite my family. I am one of six and I have three kids and some bots (grandchildren). The best eater of the lot and sometimes my blogging partner is my grandson Dan who is 11, loves sushi, seafood and almost everything many adults are scared of. My sisters and my mum go away every year for a girly weekend and the noise is indescribable. My first husband Rick (I am currently single as my second husband and I are getting divorced amicably) was appalled the first time he visited our house for a meal. Firstly everyone shouts to be heard, my father in his infintely amazing wisdom thought metal crockery was a good idea so the noise from that was incredible and my sister and I had a fight and I squirted ketchup in her hair, (it was deserved dear reader, trust me). We are born. With nothing. We die. We take nothing with us. What is important, fantastic family and friends memories. Not a lot else. I remember my father trying to swap me for 6 camels when I was young in Aden (he worked for BP with Eddie Izzards dad). I remember the one day a year it rained and we could swim in the garden. I remember going for amazing cheap family holidays with all my sisters and solitary brother where we ran free, I think we may have been feral. If I should win this competition I would take my children and grandchildren with me to experience life together. Now this may involve a talking stick, something that you hold when it is your turn to talk and inevitably use to hit someone when you get so frustrated that no one is listening (normal time = 9.5 minutes). My sisters and I have tried and failed to make it work. The food in this area is so tempting, it is local and based on the idea of ‘poor cooking’, suits me fine! They major on flavour, seasonality and simplicity. I would like to serve a range of meats and cheeses as a starter with their unsalted bread (the bread is meant to pick up the flavour of what it is used with). There would be a variety of cooked meats, pates and cheeses. If it is just my family we will stuff ourselves with the starter then need to lie on the floor on our backs while we digest before we have the main course. Oh my what a choice. The most obvious one would have to be bistecca alla fiorentina which is the statement dish of the area. If you wanted pasta you could go for the tagliatelle al tartufo which is pasta with truffles. There is also a rich sauce made from either hare or boar but I am afraid I cant eat hare as I believe they have magic powers. I love rabbits and hares are the mystical version of rabbits. Sorry but eating hare is just wrong. In fact I think it is fair to say that you may be cursed if you eat hare. If you insist on pudding, and I don’t, dear reader as you probably know, you can go for the cantucci dipped in white wine, a bit like biscotti. Wine, well Tuscany is your oyster, indeed Chianti originates here. However even the table wine will be a winner as the grape grows well here. What I can imagine, if I won this prize, is me and the kids and the bots jumping in and out of the pool, looking for places to eat and also buying amazing local food to cook at home. There will be so much noise, people playing cards, ambling off for walks and overall creating the best family memories ever.